The Dancing Rabbit Vehicle Co-op above used ELM Financing to eliminate all it’s interest bearing loans. I know, I’m making a bold claim, but it isn’t fluff. It is backed with solid numbers that I’ll share with you in a bit, but first let me tell you a little bit about our currency. 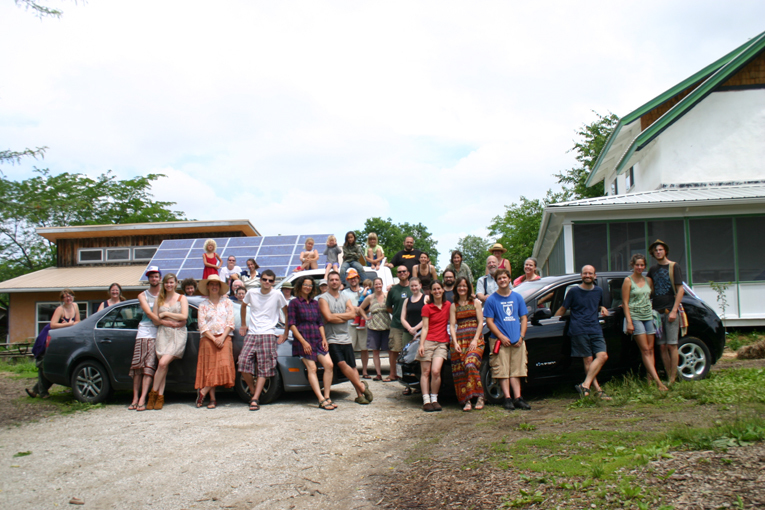 How does Dancing Rabbit Ecovillage’s alternative currency work? The Exchange Local Money System (ELM for short) is Dancing Rabbit’s all digital local currency (www.dancingrabbit.org/about-dancing-rabbit-ecovillage/social-change/economy/local-currency). It runs on the open source software Local Exchange developed by Calvin Priest (sourceforge.net/projects/local-exchange). The currency itself is denominated in “ELMs.” With a one-to-one exchange rate with the dollar and a simple online interface, it is similar to Paypal and more convenient to use than writing checks or dealing with cash. How successful is the ELM compared to other local currencies? Due primarily to its ease of use, the ELM has become the preferred currency for the members of our community. In fact, as of December 2013, the ELM System had $94,075.07 worth of currency in circulation. How does this compare to other successful local currencies? Two of the best known in the US are Ithaca Hours of Ithaca, New York and BerkShares of Berkshire, Massachusetts. In this context, having $94K in circulation makes the ELM System one of the biggest local currencies in the United States. This is a powerful accomplishment for a local currency that is accepted only by 29 businesses, nonprofits, co-ops, and community groups in rural northeast Missouri. How has the ELM system become so successful with a small user base? How is it possible that the ELM System has put almost as much money in circulation as two other local currencies that boast of having over 13 times as many businesses and community organizations accepting their currencies? The answer is simple: depth of penetration. While Ithaca Hours and BerkShares have a very broad level of participation, the portion of trade conducted using these currencies in their respective regions is tiny relative to the amount of trade conducted using dollars. This is not the case for the ELM System, as we currently average over $65,000 worth of transactions per month. By my estimates this represents between 70 and 90 percent of all the financial exchanges that are taking place in the local area in which the ELM circulates. This depth of penetration is possible because we can pay for everything at Dancing Rabbit using ELMs, including rent, food, transportation, and childcare. Even our local pizza joint (milkweedmercantile.com/cafe) accepts ELMs! In fact, for the last three years I’ve spent only ELMs within Dancing Rabbit for all my local expenses. Plus, Dancing Rabbit’s neighboring communities Sandhill Farm (www.sandhillfarm.org) and Red Earth Farms (www.redearthfarms.org) use the currency heavily, and in the last couple of years local neighbors to these three communities are starting to use the currency as well. The ELM didn’t achieve this depth of penetration all at once. In fact, in 2007 when our currency went all digital and took its current form, we had only two transactions conducted online in the first month for a total value of only $10. As you might imagine, it took lots of effort to build trust and use of the currency, but with lots of persistence it finally caught on. Why should small businesses care about the local currency? Now, how is all of this going to get the attention of your local pizza joint, much less the chamber of commerce in your own town? Furthermore, how is this going to spark interest in local currencies from small businesses all across the country? The part of the ELM System your town’s chamber and businesses will care about is its ability to provide interest-free capital financing to our local organizations. 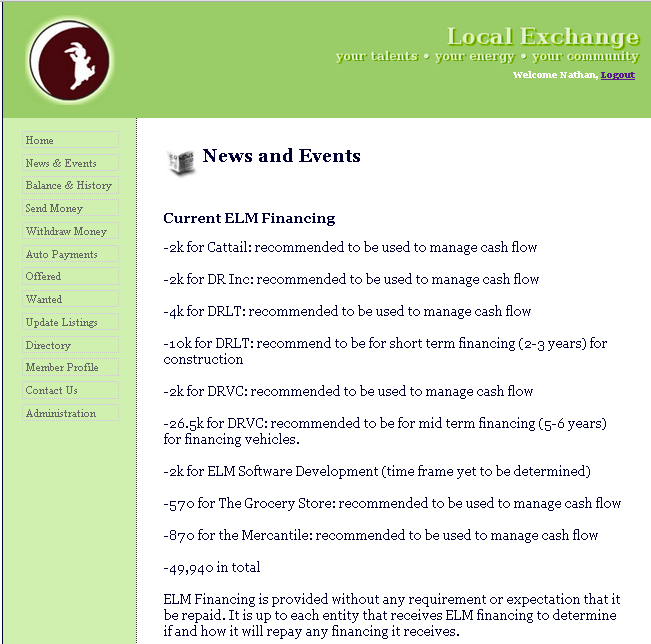 At the time of writing this article, our ELM System is providing $49,940 worth of interest-free financing to seven of the local co-ops, businesses, and nonprofits that accept the currency. In fact, a large chunk of this financing was made possible in no small part because of the previously mentioned $19K from the EcovillageEducation.us program. Just a few short months after these US dollars came flowing into the ELM economy, we sent that money right back out to work in the community by extending a similar amount of interest-free ELM financing to Dancing Rabbit’s Vehicle Co-op (www.dancingrabbit.org/about-dancing-rabbit-ecovillage/social-change/function/co-ops/dancing-rabbit-vehicle-co-op). This financing eliminated the vehicle co-op’s interest-bearing loans and resulted in a savings of $2,000 over the next five years. Expand this sort of savings across all the financing that the ELM System has provided so far, and the savings on interest payments adds up to $13,797.50 over five years. In reality our actual interest savings isn’t this high yet because most of our organizations are not fully utilizing the financing that’s been provided to them, but the opportunity is there. $13K is a notable cost reduction in interest payments. 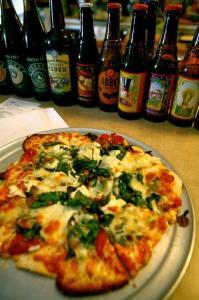 Maybe it is even enough to get your local pizza joint interested, but likely not enough to excite your chamber of commerce, and it certainly isn’t going to spark a local currency revolution. Do you think your local chamber of commerce will want to learn how they can help the small businesses in your town to acquire interest-free financing that grows at a faster rate than the computer industry? I think so! Do you think the success of Dancing Rabbit’s currency could spark a wave of interest from small businesses all across the country? It could, but only if they know about it. Please share this article with the small business owners in your town. Better yet, share it with your local chamber of commerce. Help make local currencies a central part of this country’s economy so we can provide critical financing to the small businesses that keep our communities connected and thriving at a local level. Nathan Mackenzie Brown is the Secretary of Exchange Local Money System and he has lived at Dancing Rabbit Ecovillage since 2005. Nathan is a professional online business consultant who prides himself in his ability to work an average of 15 hours a week while donating half of his adjusted gross income to worthy causes. In addition to being the Secretary for the ELM System, Nathan is an Executive for Dancing Rabbit’s Cattail Cooperative, he’s a founding member of Dancing Rabbit’s Men’s Group, and he loves to play Ultimate Frisbee when it is warm and to go sledding and play broomball in winter. 1. How does someone acquire new ELM’s? Can one exchange dollars for ELMs? What about reverse exchanging ELMs for dollars? 2. How are decisions made about what organizations to provide interest free financing too? Could a private business enterprise receive such financing? 3. How exactly do residents exchange ELMs with each other, and how many transactions does one average in a day? Does both parties of a transaction need a smart phone or some other device to complete the transaction? Sorry for the slow reply. As I explained to Robert I didn’t see these comments and first and once I did I was fairly busy with other things before I could get back to responding. `To acquire ELMs you either sell goods or service in exchange for ELMs, or you trade $s to get ELMs. Many of our organizations and businesses regularly accept ELMs for payment of goods and services that they then exchange back into $s to cover their $ expenses. 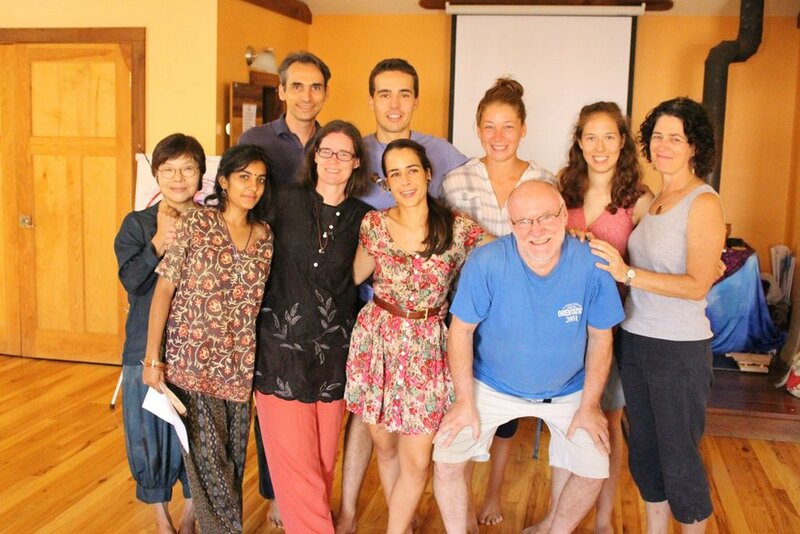 `We have created our own unique model of decision making at Dancing Rabbit Ecovillage that is a little complicated to explain, but it is rooted in consensus values and involves many committees and a village council. Within this context there is an ELM committee that makes proposals to the community about how who gets interest free financing. Everyone in the community needs to consent to how we allocate the interest free money. If someone blocks a decision, it can be taken to our village council for them to decide if the block should hold, if the proposal needs to be modified and then passed, or if the proposal can pass as is. We also have a two private businesses that have access to interest free financing, but we’ve generally given more of our interest free financing to our co-ops and non-profits. `Residents exchange ELMs with each other using this via our online software that I mentioned in the article. The software we are using is based off this open source software that you can find here: http://sourceforge.net/projects/local-exchange. We currently are averaging around 17 transactions per day throughout the whole system. Only one party needs access to the web to complete a transaction. This can be done via desktop, laptop or mobile device. What would be the costs to offer a seminar, workshop or class on setting up an ecovillage intentional community local currency? Eco-Village Puerto Rico News and Community Forum Facebook Group. I’m sorry it took me so long to reply. I didn’t get any notification of these comments, so I just happened upon them when I was checking to see how many FB shares this article had received and then I got busy with some committee work and facilitation at Dancing Rabbit Ecovillage. Robert, I would love to talk with you more about offering your community a workshop on how to set up a local currency. In order to give you a price I would need to talk with you to find out more about what you are looking for and then we could work together to come up with something that could meet your communities needs. I’ve added you on Skype and I’ll be emailing you shortly as well.